I love Cole slaw. I love it as a side with smoked baby back ribs while watching the final round of a PGA major championship, Sunday evening Eagles game, an NFL playoff game, or the Super Bowl. Here’s a new twist on an old favorite. 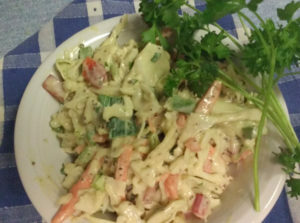 This slaw is jacked up with Dijon mustard, Greek yogurt, Cayenne pepper, some green and red peppers, and fresh green onions. Tasty! I might even try it on a hamburger. In a bowl, combine the mayonnaise, mustard, sugar, vinegar, yogurt, celery seeds, salt, pepper, and cayenne, and whisk well to dissolve the sugar. In a large bowl, combine cole slaw mix, green and red peppers, onion, and parsley. Toss with the dressing until evenly coated. Place in the refrigerator, covered, to chill slightly before serving.